disease in a community may be compared with an iceberg. The floating tip of the iceberg represents what the physician sees in the community. The tips represents those persons who have showed symptoms of the disease and are recognized as cases (diseased persons). 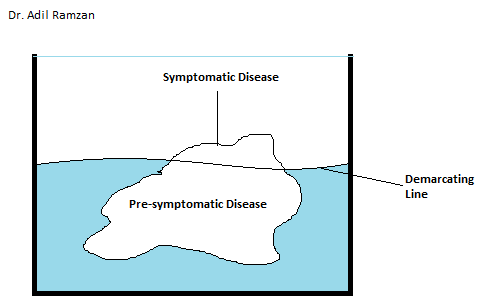 The vast submerged portion of the iceberg represents the hidden mass of the disease that is latent/ inapparant/ pre-symptomatic/ undiagnosed cases and carriers in the community. The water line represents the demarcation between clinical and subclinical or undiagnosed patients. In some cases (for example, hypertension, diabetes, anemia, malnutrition and mental illness) the unknown morbidity (represented by submerged portion of iceberg) far exceeds the known morbidity. Thus detection and control undiagnosed reservoir of disease is a challenge to modern technique. Park's Preventive and social medicine.